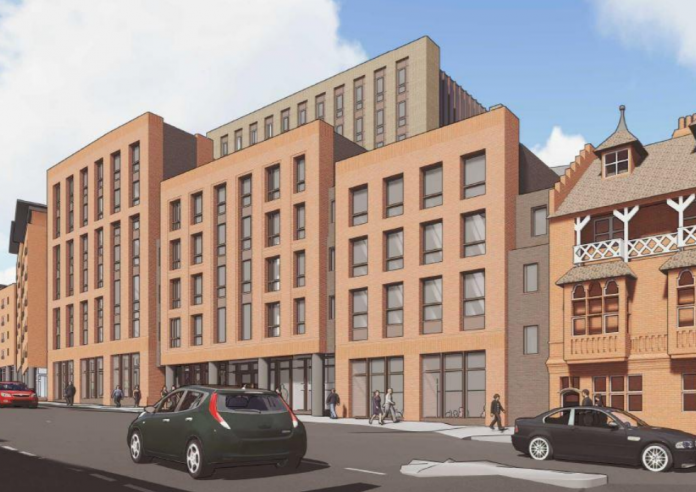 Plans for a new student accommodation building in Nottingham have been approved by Nottingham City Council. Hydrogen York Street is behind the plans which would see a development of between 4 and 10 storeys built at the site of York House on Mansfield Road. The proposed student scheme will consist of 74 studios, 52 cluster flats containing 4-8 bedrooms each, offering 346 beds in total, a gym and amenity space. According to the plans, the development will function as one single building but will be broken up into various heights to match the surroundings. The development site has been vacant for several years since a 9 storey office building, York House, was demolished to make way for a potential extension of Intu Victoria Centre. The site is now no longer part of Intu’s development plans.